Brain Breaks Revisited: Better Than Ever! I have used Brain Breaks for a while now and both my students and I LOVE them! When I posted them as my first item for sale in my TpT Store a few months back, I never would have imagined the response I received!! It has been very positive and also question-filled. I want to answer some of the questions here in one post, as well as give you some of the reasons why Brain Breaks are so useful in my classroom. Brain Breaks fit under the larger umbrella of "Brain Based Learning" which includes multiple intelligences and learning styles, among others. There is a great overview from the University of Wisconsin HERE and some practical classroom tips for engaging the brain and body HERE. They also post an extensive Brain Based Learning Book List HERE. For only a 3 pound organ, that's a lot of our oxygen to stay fully engaged! Our cerebrum or cortex is the largest part and makes up 85% of our brain- it is responsible for thinking and voluntary muscles, those that move when you tell them. So, the importance of getting oxygen flowing freely to our lovely brain is very important for our thinking and learning. I would think it is safe to say that combining movement and learning is a great way to engage all students. Breaking lessons up into small chunks, practicing teaching to each other, and linking movement with a new concept are all basic principles in Whole Brain Teaching and LOTS of additional information is available on their website HERE. We know as teachers than when a lesson runs too long, when we talk too much, or when a test is taking up a long period of time, our students' attention spans dwindle and they are not learning at their most effective level. A chance to include humor and fun stuff any time of day with no additional materials! Yay for quick, easy and fun!! I then choose a break- there are lots to choose from, but I begin the year by introducing them one at a time. This allows me to model, for us to try the break together, and for the kids to remember it for the future. Later in the year, I will sometimes have a student choose a break (a very special treat for them!). The purposes of the breaks are also different, so some I reserve for energizing times, like "Air Band" and others are for more centering times, like "Plank". Some involve partners, most are solo. Only a few use props like a chair or some music, but no materials or prep-work is needed on your part for these. All of them, however, do have an instant effect on the environment in your room. As the class becomes more familiar with the Breaks, adjustments are always made and that's what keeps it fun. For example, while doing "Plank" lift one leg off the ground, then the other. Then, lift one hand off the ground, then the other. The possibilities are endless and therefore stretch the usefulness of these little sticks to keep them fun the whole year long. There are also times I will use the Breaks as a reward- see my past post on The Scoreboard HERE for an example. Pick them up from my TpT Store today by clicking HERE. If you have already purchased this set: simply re-download it from TpT's "My Purchases" page. 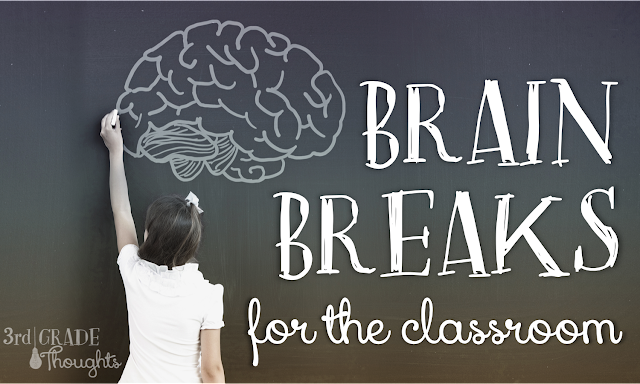 I hope this post was helpful in explaining these Brain Breaks and gave you some new ideas about how you can use them in your class! I would definitely buy the Brain Breaks - they sound fantastic, thanks for adding more!!! i would love this! i'd get your morning meeting packet, your chevron binder covers, or something else! I love your store! I love your products! I think I would pick your brain breaks packet and morning meeting packet. I would buy the brain breaks or some of your whole brain teaching ideas. Also, I clicked on your TPT store and when I came back the rafflecopter had wiped out all my entries, so I am going to submit again. I love brain breaks and am always interested in getting new ones. I liked the word work (How much is the word worth) for Daily 5. So excited about your giveaway. I've been eyeing your brain breaks for awhile. I love your store so much it would be hard to choose. Your Brain Breaks sound fantastic so that is what I am leaning towards right now! I use brain breaks in my everyday life, and I use Brain Gym when I know I need that extra boost. SO COOL! Thanks for all the work you do! I would definitely buy the brain breaks! I would DEFINITELY buy the brain breaks! You are awesome! Oh boy. If I would win I would get your Morning Meeting Pack and Brain Breaks. I would purchase your Brain Breaks and your How much is it Worth is already in my wishlist of items so I'd get that too. I love all your products. I would purchase Brain Breaks and anything else with meaningful movement! Thanks for a great giveaway. I'd purchase Brain Breaks to use in my classroom and maybe a few of the Word Work items for the Daily 5! I would get the Brain Breaks pack, and I LOVE the chevron binder covers and direction signs. I'm thinking about using chevron next year, and those would work perfectly! Brain Break pack, Monster Task card, any of your spelling activities! I would def. get brain breaks. I love them! Also I love the chevron binder covers. Very cute! I would go after the brain breaks! Anything to make WBT more successful in my classroom is a winner for me! Thanks! I would buy Brain Breaks! It's on my wishlist!! I would totally get the brain breaks! Love this idea! I would buy your brain breaks with my winnings! Oh I have been wanting your brain breaks for awhile, so hooray for added ones!!! This means I HAVE to have them now!! I also would like the morning meeting packet.. I want to start doing that next year. Great additions and facts about brain breaks too! Wow! As a first year teacher these will be great for both my students and I! I would definitely get those brain breaks! I would buy your brain breaks- definitely better looking than the ones I've been using!! Your store has so many good things in it! I would buy your brain breaks and WBT materials. I am new to your blog, but LOVE IT so far! I promised myself I would incorporate "brain breaks" last year, and never really did. Fortunately, I kept my kids very active through math center rotations. This year, though, I WILL be using "brain breaks"! I love your blog and look forward to reading your posts. If I were to win this giveaway I would definitely buy the Brain Breaks package that you've created...<3. I so love everything in your store... 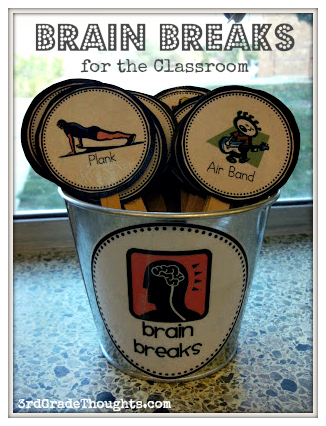 I definitely want to purchase the brain breaks, and probably your school supply labels! I'm new to your blog but will continue to read. Well done! Love the tips and ideas you have!! brain breaks for sure. I use energizers-its also a free download. I youtube lots of brain breaks, too. But I need them all in one area! I would purchase the brain breaks that have been on my wish list for quite some time! I would buy Brain Breaks! 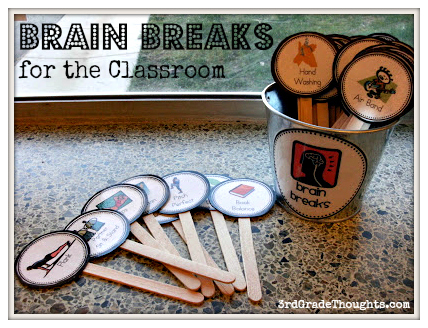 I would definitely buy Brain Breaks! I would also love to purchase your Place Value Spelling and your cute cardinal direction signs. I hope I win! I would buy your brain breaks for sure! I would love to use your brain breaks, thanks! It's been in my wishlist cart for quite a while! I would love some of your word work activities! I would love to have the brain breaks and the would you rather questions for kids. I know my kids would love both :-) Keeping my fingers crossed!!!! Thanks for the give-away! You post great ideas! I would totally buy the brain breaks! Thank you for a terrific giveaway. I have the Brain Breaks, the Word Work Trio, and Would You Rather Questions on ny wishlist. I love your materials. They are so colorful and so needed. Thanks for all your sharing. I would buy the brain breaks and the did you know fun facts! Those are both very creative! I'm a new follower of yours - thanks for doing this giveaway! I would get the Brain Breaks and Morning Meeting. I would definitely get the brain breaks and Monster Partner cards. I would totally get the brain breaks! I really liked the brain breaks and look forward to trying them out in my classroom this year. You have so many awesome ideas and I have learned so much from you about whole brain learning. I would definitely be adding your Brain Breaks to my cart. I love this idea and know my class benefits from the break. Plus, yours are so much nicer looking than the hand-written set I made this year! These are definitely on my wish list, as is half your store. :) Nice job on everything! Thanks for the explanation. I've been seeing a lot about brain breaks but was only guessing as to how to use them. I was pretty close! I just checked out your store and I would LOVE to have any of your spelling/word work activities. They are great. I'd buy the brain breaks and morning meetings sets...woo hoo...$10 even! I'm loving the brain breaks! It will be a great addition to my routine. I love your Brain Breaks and your Chevron Binder Covers!! I would love the brain breaks. I started following because I'm researching classroom management, and find the Whole Brain idea very intriguing. I'd like to try it out in my classroom next year. Love so much of your stuff....brain breaks, word work activities, supply labels, monster partner cards, etc. Thanks for all the ideas!! I would pick the Brain Breaks, Word Work Trio and another that is on my wish list. Thank You so much for such wonderful ideas!!! I have been using whole brain teaching for about three years and next year I am starting the Daily 5 and Cafe in my third grade class!! Your blog has given me WONDERFUL ideas! I love giveaways!!!! I would use the 10 for brain breaks. :) Thanks! I would buy the Brain Breaks, of course! I would definitely get Brain breaks! Thank you so much for the updated brain breaks. I was just on my way tomorrow to get the originals printed in color (of course, can't do that at school, have to pay for it myself). So thankful for the timing, and your work! I would get the Morning Meeting Packet!!! Thanks for all your ideas!!!! I would definitely buy your Brain Breaks! I pinned them some time ago because I thought they looked great! I would love to have your brain break set. I use WBT methods and I'd like to add the breaks to my classroom. I will definitely be purchasing the brain breaks! I love the fact that they can be used all year with some simple modifications! Thanks for the contest! I saw your brain breaks on pinterest and pinned them, now I found your blog through the classroom theme linky! I have to learn more about the Brain breaks.I’m your newest follower. Please check out my blog if you get a chance. Calling Plays in 2nd Grade. These have been on my wishlist for a while! Would love to win this! I love your brain breaks and I can't wait to try WBT this school year! I love giveaways! I already own your morning meeting and your monster partner cards (Oops, guess I should learn to wait)! I would also purchase: Brain breaks (no surprise there) and possibly another set of the monster partner cards for my grade mate (as a welcome back to school gift). I also like your word work trio! I would definitely grab your Brain Breaks!! I would purchase your WBT signs and probably your monster grouping cards! I love the brain breaks! I would also purchase either the "Did you know facts", "Desk/cubby fairy" or the "morning meeting packet".... or better yet all of them! I love the Brain Breaks! Your word work trio has been on my wish list for a while! Thanks for hosting a giveaway! I would love to get the Brain Break pack and the Morning Meeting pack! Great Giveaway! I'll be starting my first year of teaching! The Brain Break packet would be so wonderful!! Thank you!! I just started using Kagan structures and incorporating brain breaks into my classroom last year. I felt thought hat I got stuck in a rut using the same ones over and over, so I feel the Brain Breaks pack would be a great way to remind me to do them more often and to help me mix it up more. I would love this.. Thanks for the opportunity. I'm excited to have stumbled across your blog. Thanks in advance for sharing all of your great ideas! I somehow rambled my way onto your blog and I must say, I am quite impressed. This is such a great idea! I'm heading over to TpT to pick mine up! Love it! I also teach 3rd grade. I'd love for you to stop by my blog and check it out!